Blue Harbor Tropical Arboretum is a paradise within a paradise, a tropical Eden located on 160+ acres on the island of Roatan, Bay Islands, Honduras. It is home to the only tropical botanical conservatory in the Caribbean, and lettuce and herbs from the Blue Harbor Plantation are sold in local supermarkets and used in restaurants all over Roatan. Honduras’ history is connected to tropical plants and fruit trees, going back to the early 1900s during the days of the Standard Fruit Company and Tela Railroad Com-pany exporting bananas to the U.S. Also, in this era the Lancetilla Botanical Gardens in Tela was developed as an experimental garden. Today Lancetilla is still regarded as one of the largest tropical botanical gardens in the world. During this period a large variety of plants from all over the world was introduced to Honduras. Many of these unique tropical plants can be found today at Blue Harbor Tropical Arboretum. The conservatory houses over 500 hundred different plants and trees, including a dozen heliconia varieties, mature Honduran mahogany, various fruit trees and hundreds of exotic plants. 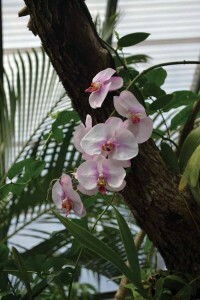 Among its 30 species of orchids is the orchid vine, which produces vanilla beans. Outside the conservatory are tropical display gardens, which include seasonal fruit and nut orchards. In addition to its collection of exotic species of tropical fruit trees are over 400 mature cashew trees. Also in this area you find over 45 varieties of heliconias and ornamental gingers, which put on a stunning display of flowers year round. Framing the orchard is a 2.3-million gallon pond, which serves as a catchment for rainwater that is used to maintain the vast gardens during the six-month dry season. It’s also home to fish, turtles, frogs and native birds. 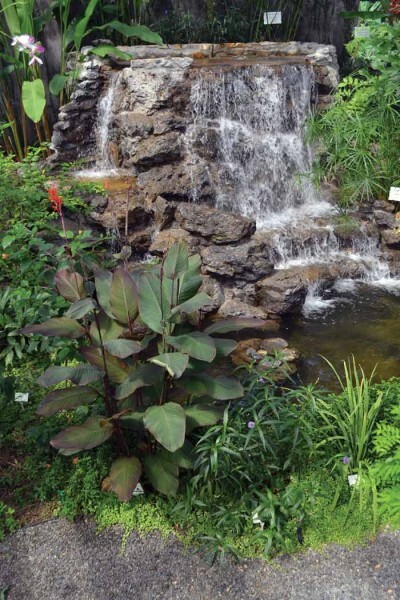 Blue Harbor Tropical Arboretum is committed to water conservation, sustainable agricultural practices, and protecting our fragile eco-system. Blue Harbour Plantation, the hydroponic farm, is an excellent example of environmentally friendly innovation and has provided local residents and restaurants with access to a variety of vegetables, which are difficult to grow in tropical environments. Over 70,000 heads of lettuce grow in the shaded hydroponic area; you will also find 11 varieties of fresh herbs. Green leafy lettuce does not grow well in tropical environments due to the hot and humid weather. The hydroponic farm has a unique system which cools water to 16 degrees Celsius. The water is then fed to plants with a mixture of nutrients. This technique has resulted in better germination and plant growth and with the aid of shade has created a thriving, eco-friendly, water-saving, unconventional farm. Blue Harbor Tropical Arboretum continues to evolve. Recently an old bodega was converted into a sanctuary for birds, agouti and other animals. In this sanctuary iguanas will be protected, raised and released on the property to expand and diversify the local iguana population. The arboretum provides a unique venue for bird watching and is becoming increasingly popular as more tourists discover its diversity. An expansion of the conservatory to house tropical butterflies is among future plans, as are nature trails that will allow visitors to explore all areas of the property. Additionally, the arboretum plans to work with native islanders to form a co-op for the commercialization of locally grown cashews. With so much to see and experience at Blue Harbor Tropical Arboretum, it is a must see when you visit Roatan.